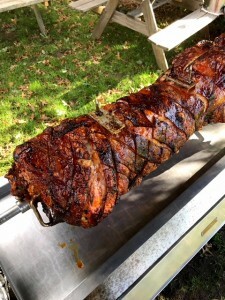 There is more to Hog Roast Bolton than just delicious hog roasts and professional catering teams. We also have a team of dedicated engineers that design and manufacture our trusty hog roast machines that we use for every event! On Tuesday Paul made a visit to our factory in the North West to have a look at our process and try out some of our roasting machines. Paul was the owner of a small catering business and, after seeing the popularity of Hog Roast Bolton, wanted to get in on the hog roasting action and so decided he would purchase one of our machines. The great thing about buying directly from us is that our team of engineers will be able to show you exactly how the machines are made and demonstrate that they are of the finest quality and are more than up for the job of hog roasting delicious meals for your clients. We also give you a course in the art of hog roasting so that you are fully prepared to use the machine after you purchase it and we are always just a phone call away should you have any questions! Impressed with our attention to detail and the promise of advice should he need it, Paul decided there and then to order one of our larger machines, the Titan. This machine is ideal for caterers as you can cook two hogs at a time should you need to, and the machine has plenty of attachments that allow you to change the way you roast such as a BBQ attachment and roasting trays for your accompanying dishes. After showing him how to use the Titan and offering to supply Paul with the meat he would need, Paul was all set to cater his first Hog Roast Bolton event! We are looking forward to hearing about all of Paul’s hog roasting success!